We’re spoilt for choice with places to eat and drink here in Leeds. Whether you’re looking for an indulgent brunch, a street food feast or an epic craft beer selection, there’s a bar or restaurant with your name on it. But I’ve always thought that we’ve been missing a good old fashioned fancy restaurant. Somewhere worth dressing up for, where you can sip champagne and enjoy a delicious three course meal. Enter: The Ivy. 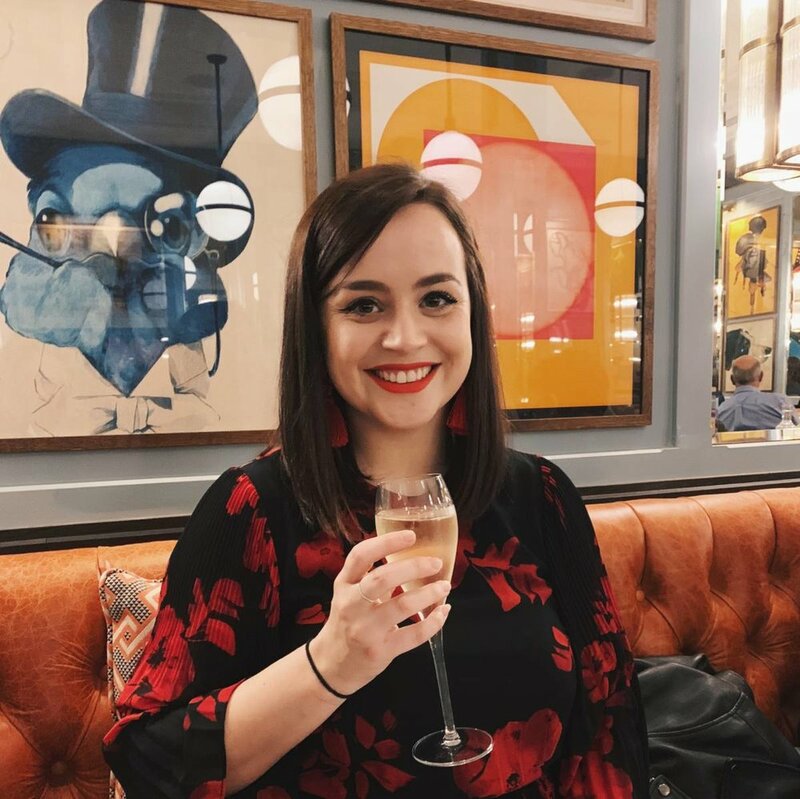 The Ivy opened in the Victoria Quarter last month, and they very generously invited Sam and I down to give it a try. I’ve eaten at their restaurants in Edinburgh and London and always thoroughly enjoyed it, so I knew we’d be in for a treat. We arrived at 7pm on a Thursday evening and the place was absolutely bustling - not bad for a restaurant that’s only been open for a couple of weeks, and even more impressive considering the size of the space. The restaurant spans two floors and there’s also a beautiful bar area that can seat up to 12. And of course, because this is The Ivy, the decor is gorgeous. Think rich, jewel tones, plush velvet seats and ornate brass light fittings. The walls are adorned with quirky and unique prints, and don’t even get me started on the toilets, which were some of the fanciest I’ve ever seen. Seriously, I spent a good 5 minutes recounting just how gorgeous they were, much to Sam’s bemusement. On visits to their other restaurants I’ve always been blown away by the service, and The Ivy Leeds was no exception. We were seated quickly and the menus were thoroughly explained to us. We started the meal with some drinks - champagne for me and a Barrel Aged Boulevardier for Sam - and some truffle arancini while we decided on our starters and mains. I opted for the white onion soup which was absolutely divine - warming, flavoursome, and topped with the most delicious cheddar croutons. Sam went for the roasted scallops, which were beautifully presented with chorizo and butternut squash. The portion sizes were generous and we both thoroughly enjoyed our choices. It took us a while to decide on our mains as there were just so many options! I’ve heard amazing things about The Ivy shepherd’s pie, and Sam was tempted by the extensive seafood menu, but in the end we both opted for a steak - fillet for me, ribeye for Sam. We ordered some chips and broccoli as accompaniments, along with a bearnaise sauce for me (my favourite!) and a classic peppercorn for Sam. Both steaks were perfectly cooked, and we both remarked that we had never eaten such good steak in Leeds. In fact, Sam said it was the best ribeye steak he’s ever had! The fillet was soft and tender, while the ribeye was bursting with flavour. We washed them down with a bottle of the house red, and honestly, we were in foodie heaven. We’d thought we were both a bit too full for a dessert, but when we saw the chocolate bombe on the menu, we couldn’t resist ordering one to share. It was absolutely delicious, and watching our server pour the hot salted caramel sauce over the dome was so entertaining. For such an indulgent dessert it was actually quite light, which was perfect after such a heavy meal. We both left feeling full, tipsy, and most of all happy! Everything about our experience, from the food itself to the customer service was excellent, and I know we’ll be back at The Ivy again soon. It’s the perfect place for celebrating a special occasion, or even warming up with something delicious after a hard day’s shopping. It feels like such a brilliant addition to Leeds, and I’m so happy to have somewhere so gorgeous on our doorstep. * We received a complimentary 3 course meal for review purposes, but all opinions and thoughts shared in this post are genuine. We had a thoroughly lovely evening and I’ll be back as a paying customer very soon!